Taarifa zilizopo ni kwamba rais Hugo Chavez wa Venezuela alimtangaza makamu wake wa rais Nicolas Maduro kuwa mrithi wake iwapo lolote litatokea. Hii ni baada ya Chavez kuwasili Havana Cuba kufanyiwa operesheni ya nne ndani ya miezi 18. Je kama walivyowafanyia akina Bob Marley, Kwame Nkrumah, Jacobo Albenz, Salvador Allende na wengine wengi, Marekani hatimaye imempata Chavez? Je kansa ya Chavez ni ugonjwa au ambukizo la CIA? Kwa habari zaidi GONGA hapa. Venezuelan President Hugo Chavez suffered bleeding during surgery for cancer in Cuba on Tuesday but is recovering well, his Communications Minister said. Ernesto Villegas said the 58-year-old president will require "proper time" to recover because of the complexity of the surgery and its complications. This is the president's fourth operation since last year. Mr Villegas called on Venezuelans to continue praying for Mr Chavez. President Chavez "suffered bleeding that required the use of corrective measures", he said in a statement. 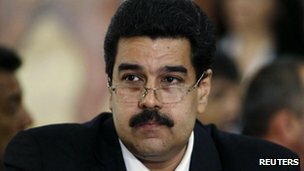 But Venezuelan Vice-President Nicolas Maduro says the condition of Mr Chavez has improved "from stable to favourable". On Wednesday, Mr Maduro said the president's latest surgery had been "complex, difficult, delicate" and he faced a "complex" recovery. Former bus driver The president, who was re-elected to a fourth term in October, is due to take office on 10 January for a six-year term. The Venezuelan constitution states that, should the president leave office in the first four years of his term, an election must be held within 30 days. Mr Chavez said Venezuelans should vote for Mr Maduro in fresh elections should his health fail. The cancer was first detected during initial surgery for a pelvic abscess in June 2011. During the weekend, Mr Chavez himself acknowledged the seriousness of the situation. "There are risks. Who can deny it?" he said in a televised speech. Mr Maduro, a former bus driver, is one of the president's closest advisers. The Venezuelan government has been giving daily updates on the president's health, unlike during his previous visits to Cuba. It may be preparing the Venezuelan people for the possibility of Mr Chavez's "socialist revolution" having to go on without him, said the BBC's Sarah Grainger in Venezuela. Naona karibu wabaya wote wa Marekani ama wameshatoweka au wako mbioni kutoweka kuanzia Saddam Hussein (Iraq), Moamar Gaddafi (Libya), Kim Il Jong (N. Korea), na Osama bin Laden (Al-Qaeda). Hawa tayari ni marehemu waliokufa. Wengine ni Hogo Chavez (Venezuela), Bashar al Asad (Syria), Mahmoud Ahmedinejad (Iran), na wale vichwa ngumu wa Hamas; hawa ni "marehemu" wanaoishi kwa hisani ya CIA. Ni kweli Hugo Chaves anaumwa lakini ugonjwa wake hauusiani kwa namna yoyote ile na marekani au cia. Acheni kupotosha watu kwa hiyo kila mtu akiumwa huko amerka na ulaya chanzo ni marekani? MEXICO CITY, December 11 (RIA Novosti) - Venezuela's President Hugo Chavez has just months to live, a Venezuelan doctor said on Tuesday. Venezuelan doctor Jose Rafael Marquina, who is based in the United States and is known for his accurate prognoses on Chavez's health, told RCN radio that Chavez has "between two and three months to live." "The disease has entered an aggressive stage. He has metastases in the lumbar area, compressing nerves around the lumbar area of his backbone, which may lead to paralysis," said Marquina, who claims to have access to firsthand sources and information about the president's health. Chavez announced on national television late on Saturday that he was flying to Cuba for new cancer surgery, and named Vice-President and Foreign Minister Nicolas Maduro as his possible successor. Chavez, 58, who has ruled Venezuela for 13 years, underwent three operations for cancer and four courses of chemotherapy in Cuba and Venezuela within a year. He said that recent tests had revealed malignant cells. Chavez, who was reelected for another six-year presidential term in October, said the pain he felt were due to strain during the election campaign and radiation therapy treatment, adding that surgery was vital, and an illness like this always carried risk. Asante kwa taarifa mkuu. Kazi ya sia hiyo. Huyu sia ni hatari sana. Hakuna atakaye ishi milele hapa duniani tunapita na wenyeji wetu Mbinguni. The American eagle button has concluded its mission to lay down the strongman Chavez. Atakuwa of same blood na Mugabe. Get well soon Chavez. if that is the case then he might have very little time left. I remember one of my uncle had Prostate cancer with lumber metastasis. He looked normal for about 5 years from when he was diagnosed, but after the surgery his condition deteriorated very rapidly. We tried the use of Radiation followed by Chemotherapy but these did nothing to slow down the speed of deterioration. within the span of 3 months he became paraplegic, Three months after he became quadriplegic and a month later he died. it is a very bad disease once it reach that aggressive state. But since he can afford the best doctors money can hire, may be he will live longer. NB: Men are advised to do an annual checkup as soon as they reach 40 yrs old. Doctor based in US predicting Chavez destiny !!! MOSCOW, December 13 (RIA Novosti) - Venezuelan President Hugo Chavez, who underwent a fourth cancer surgery in Cuba on Tuesday, is facing a complex recovery, Vice-President and Foreign Minister Nicolas Maduro said. Chavez, 58, who has ruled Venezuela for 13 years, underwent three operations for cancer and four courses of chemotherapy in Cuba and Venezuela within a year. He said that recent tests had revealed malignant cells. It was a complex, difficult and delicate surgery, which means that the post-surgery recovery will be also complex and difficult, Maduro said on air of the national radio and television. Tuesdays operation on Chavez in Havana lasted more than six hours. Maduro said that he will be keeping all Venezuelan people informed on the recovery process of the countrys leader. Last Saturday Chavez publicly announced his planned surgery in Cuba and named Maduro as his possible successor. Venezuelan doctor Jose Rafael Marquina, who is based in the United States and is known for his accurate prognoses on Chavezs health, told RCN radio that the disease has entered an aggressive stage and Chavez has "between two and three months to live." Hata yule wa libya tuliambiwa kabakiza miezi mitatu lakini akakaa zaidi ya miaka miwili. Ukiona mvenezuela anaongea kutoka us ujue ni wale wale wanaotaka wachache wanufaike majority wawe maskini. Huwa hawapendi rais anayedistribute wealth kwa maskini! Duu Miezi 1,000,000 ni sawa na miaka 83,333. Unamtakia Chavez kuishi miaka hii yote?